﻿ Cristiano Ronaldo: "I still don't know if I'll attend the FIFA Ballon d'Or ceremony"
After helping Portugal to qualify for the World Cup in Brazil next summer, Cristiano Ronaldo has returned to Madrid where he still has 8 games left to play before the end of the year. 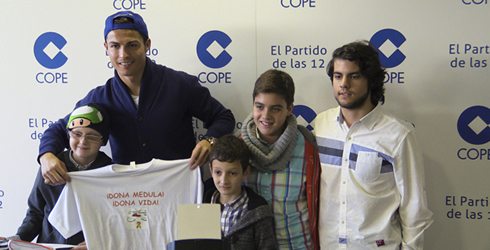 This past Wednesday, CR7 attended an event together with 3 kids that are fighting leukemia and answered all the questions posed with his usual frontality. 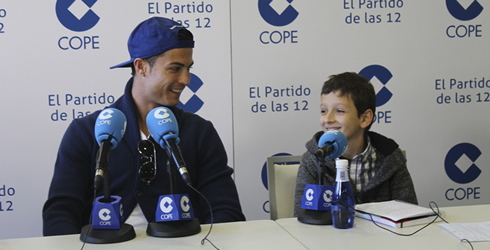 The following questions made to Ronaldo were asked by journalists and the kids suffering from leukemia that were present at the "Radio Cope" studios to attend to this event. Question: Hello Cristiano! How are you doing? It's true you are living a terrific moment in your career, woudn't you agree? 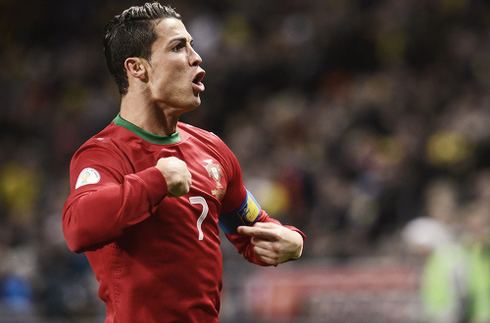 Ronaldo: "The Portuguese people are very calm actually. I don't think there would be any problem. We can tell that everyone is very happy with us in Portugal and that's good. However, it's a tough period for Portugal with the economic crisis, just like it is in Spain but it a smaller scale, so it feels great to have given a good reason for our people to smile more, at least during those 2 hours of football. Question: Are you a bone marrow donor? 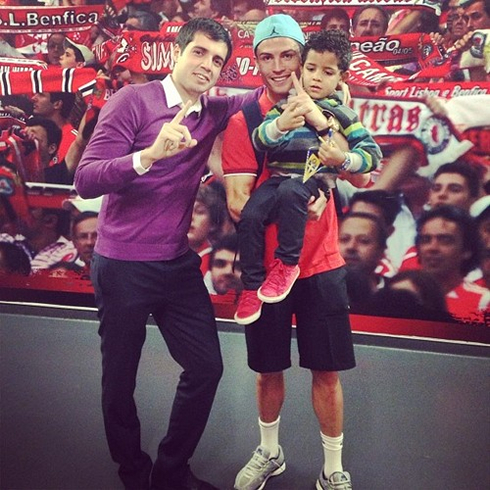 Ronaldo: "Yes I am, for the past two years already..."
Question: It all started when Carlos Martins son came out to public to announce that his son was suffering from leukemia and needing a bone marrow transplant, isn't that right? Ronaldo: "Yes, it happened when Carlos Martins was still with us in the Portuguese National Team. He commented with the group that he son was going through a complicated disease and all his teammates immediately wanted to do something to help because we understood how serious the situation was. A lot of people may still think that being a bone marrow donor is a complicated process, but all you have to do is to give blood, which is something that doesn't harm us at all. I've done it a few years ago and if I had to do it again, then I would certainly do it. It doesn't hurt and it's something all of us can do since it can help many people out there, from little kids to grown up adults. Ronaldo: "That's a perfectly normal situation and I'm here to appeal for everyone to do it, especially here in Spain where millions of people live at and doing it would certainly increase the living chances from those who are suffering from these type of diseases. It really doesn't hurt or cost anything and the person who goes through it will feel better the next day, after knowing that they have done something that can help others. Question: How many of your Real Madrid teammates have you managed to convince to also be eligible to donate their bone marrow? Question: When you score a goal, you usually do several gestures and shout "Calma, calma, calma..." ["Calm, calm, calm...]. Why do you do that? Ronaldo: "I say that in Portuguese. I'm feeling very happy in this club and in the Portuguese National Team and what I want the most is to keep this form until the end of the season." Question: Do you feel wanted and loved by the Real Madrid fans? 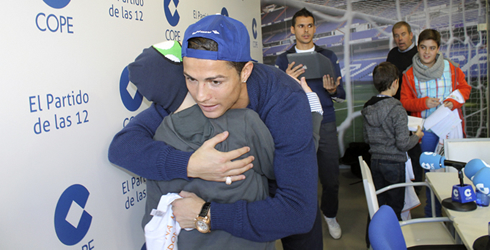 Question: Right now, do you feel you are the biggest idol from the "Madridismo" ? Question: Doesn't that make you feel overwhelmed sometimes? Ronaldo: "Usually you say that there is a lot more respect in England than there is here, but it's a different kind of respect in my opinion. It's just different cultures and we just have to get used to that. You have to bring the fans to your side by what you do on the pitch and you have to give everything you got for the club. However and after you do that, you'll always have to keep a high level of professionalism so that people don't forget what you've done for the club. I'm not saying this just thinking about my own case. I appreciate that when others look at me, they see how professional I am and how I'm willing to give everything I have for my club. Question: Would you like to retire in Madrid? Ronaldo: "Yes, that's a possibility. I don't think much about the future though, because I rather think about the present. However, when the present is good, when you feel happy where you are and motivated to do your work, then the future doesn't worry you that much. The truth is that in these moments, I feel like I want to end my career here because I'm immensely happy at this club, I love living in Madrid, playing at the best club in the World and I simply can't ask for more than this. Question: Do you think you have reached a level as a footballer, which you simply can't improve further? Ronaldo: "In my head, I always think I can get better. My main goal and ambition is to always improve. However, it's natural that we end up reaching a certain level which is very hard to surpass, but I always like to think I'll manage to be better. Right now, I'm feeling very well prepared and it's possible that I'm going through one of the best moments in my football career. I'm at a very high level and I hope to maintain it until the end of my career. Question: But do you feel like you are the best football player in the World right now? Question: Don't you think you've changed your image a bit and that now you have less people thinking bad things about you? 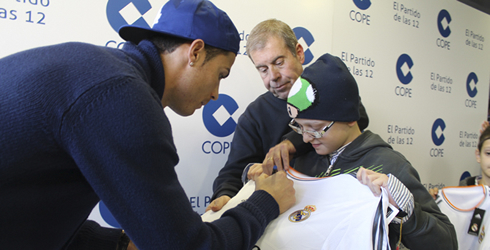 Ronaldo: "I try not to think much about those things. My focus is always about what I do on the pitch. However, if we're capable of improving off the pitch, then it's also important of course. Perhaps my age and experience now help me seeing things in a different manner. Perhaps I now think differently from what I did 4 years ago and now I don't make certain mistakes... That's just part of my development and I feel I am better prepared these days, so I'm naturally happier than before. Question: How many hours do you dedicate to training evey day, in order to keep such a good shape? Ronaldo: "I always try to work and train very well. Therefore, I try to be the most professional I can be in everything I do. It's normal that sometimes things won't go the way we want, but throughout the year I always try to keep my daily routines, regardless of the team we are going to play against. I always prepare myself the same way, may the game be against Osasuna or Barça. Question: What would go through your mind, if at the best moment of your career, you would get diagnosed with leukemia? Question: Would you like your son to become a professional football player? Ronaldo: "I would be delighted, that's the truth. When he was 2 years old, he loved cars. Now that he's a bit older, he's always obsessed with the football and telling me 'Daddy, daddy, let's go play'. And I simply can't tell him no, because my dream is to watch him playing. He has already been surprising me at such a very young age. The other day he asked me to get him his first football boots with studs. He's already kicking the ball very well, and I can tell you I'm very excited with him!" Question: If you do end up winning the FIFA Ballon d'Or, would you dedicate it to the kids that are suffering or already suffered from leukemia? Ronaldo: "I can tell it in front of all of you... If that happens, you're all invited to come to my party!" Question: You almost never get injured, neither you struggle a lot with physical problems. How do you manage to do it? Ronaldo: "Thank God I don't get injured that often, but I think these things don't happen by chance. If you train well, then you're less likely to pick up injuries. I dedicate 100% to my football activity. But maybe God is also generous with me on that and helps me keeping away from serious injuries. Question: Are you planning on attending the FIFA Ballon d'Or ceremony? Cristiano Ronaldo next match for Real Madrid will be against Almería for the Spanish League 'La Liga', this Saturday (November 23, 2013). You can watch Juventus live stream, Almería vs Real Madrid live, Barcelona vs Granada stream, West Ham vs Chelsea live and Everton vs Liverpool live, all matches provided from our soccer live section.